For those of you who have never been, summer is a wonderful time to visit my home town of Ottawa, Canada. Not only is Ottawa the capital city of Canada, home to Canadian Parliament and the Rideau Canal (a UNESCO World Heritage Site), it’s also surrounded by an amazing array of outdoor adventure activities only minutes from downtown. I’ve always thought of Ottawa as a big-small city: big enough to keep you busy when your craving city life but small enough that you can get away and be surrounded by nature within minutes. Since growing up here has allowed me to explore the area, I’ve compiled a list of 7 outdoor adventures to try while visiting Ottawa. There’s no shortage of hiking trails in and around Ottawa. Gatineau Park in Quebec is a conservation park located just 15 minutes from downtown Ottawa and is a wonderful place to immerse yourself in nature, year round. Gatineau has many hiking trails through the forest, varying in length and difficulty so you can pick one that’s right for you. One of my personal favorites is the Wolf Trail. This 8.4 km trail takes you up to the highest point in the park, offering incredible views of the Ottawa River set back in the huge Ottawa Valley. If you’re looking for an easier nature walk, Pink Lake is a sure bet. This family friendly trail takes you on a nice nature walk around Pink Lake (its not pink though) and has a few lookouts along the way. View of Pink Lake from the first lookout. Ottawa is also blessed with many kilometers of Greenbelt Trail systems scattered throughout the city. This makes it easy to enjoy nature right inside the city limits. In the summer you can hike, trail run and even bike these trails. In the winter they are converted into snowshoeing and cross country ski trails so they can be enjoyed all year long. Boardwalk in Ottawa’s Greenbelt (Jack Pine Trail). Feeding the chickadees while hiking on Greenbelt trails. Watching the sunset across the lake while listening to the call of the loons as you stare into a crackling camp fire, you can’t get much more Canadian than this! Camping is one of my favorite summer activities and usually takes over my weekends all summer long. The wonderful Gatineau Park is close by and has many options for camping depending on your preference. From yurts and cabins to wilderness camping, it’s a great way to spend time in the great outdoors. If you’re interested in a canoe camping trip, I highly recommend heading north into Quebec (approx 1 hr drive) to Lac Poisson Blanc. There’s a regional park that manages some campsites on this large lake that you can reserve ahead of time, or you can seek out one of the many free sites situated around the lake. The stunning Algonquin Provincial Park just over 2 -3 hrs drive away from the city and is one of the most beautiful parks in Canada. There are plenty of options here as Algonquin offers car camping and wilderness camp via hiking or canoeing. Canoe camping in Algonquin Park. Equally impressive La Verendrye Wildlife Reserve located 3 hrs north of Ottawa in Quebec is one of my favorite places to camp. With a distinctly different type of forest (northern Boreal Forest), this park has beaches, lakes, rivers and many convenient canoe camping loops. They offer car camping, cabins and RV sites at the main entrance to the park, La Domaine. Canoe camping in La Verendrye. If you’re looking for something closer to home head to Fitzroy Provincial Park. Only about 45 min from downtown Ottawa, its a beautiful family friendly RV and car camping park with a beautiful beach. All of these locations are perfect for enjoying the sights, sounds and company of local wildlife while camping on the Canadian Shield. Taking on the challenges of an aerial course high up in the trees and zipping through the forest is a great way to spend time outdoors! For this you have 3 options, both within easy driving from Ottawa. The first and closest option is Camp Fortune Zip Lines and Aerial Park located just 15 min north of Ottawa near Chelsea, Quebec. Camp Fortune is a local ski hill but for 3 seasons of the year they open up their aerial course for some tree top action. The second option is Lafleche Park, located about 30 min just north of Ottawa in Quebec (open year round). The aerial course starts out low to the ground and gradually increases in height as the you move on (and so do the zip lines!). After traversing the tree tops, you can also do a bit of exploring under ground. As an added bonus, this park is home to the Canadian Shield’s largest visited cavern. Traversing the high aerial park. The first of many zip-lines! The third option is Chutes du Coulonge Park. This aerial park traverses a white water river canyon, complete with wire bridges and a via ferratta course along the canyon walls. The zip-lines take you across the river canyon and through the beautiful forest. Be sure to head over to the lookout to see the waterfalls! Crossing the canyon on a wire bridge. Take the leap over the beautiful Gatineau hills! 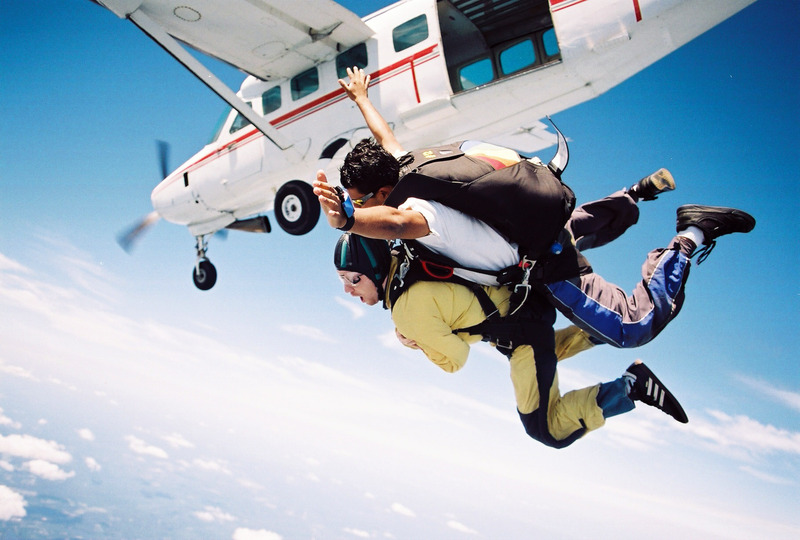 Go Skydive is located on the Quebec side just 15 min from downtown Ottawa and is the company I used when I took the plunge for my 30th birthday. Since my birthday is in the fall I got to enjoy incredible views of the Gatineau’s while they were full of fall colour. The views are equally spectacular in the summer with the rolling hills and the Ottawa River. 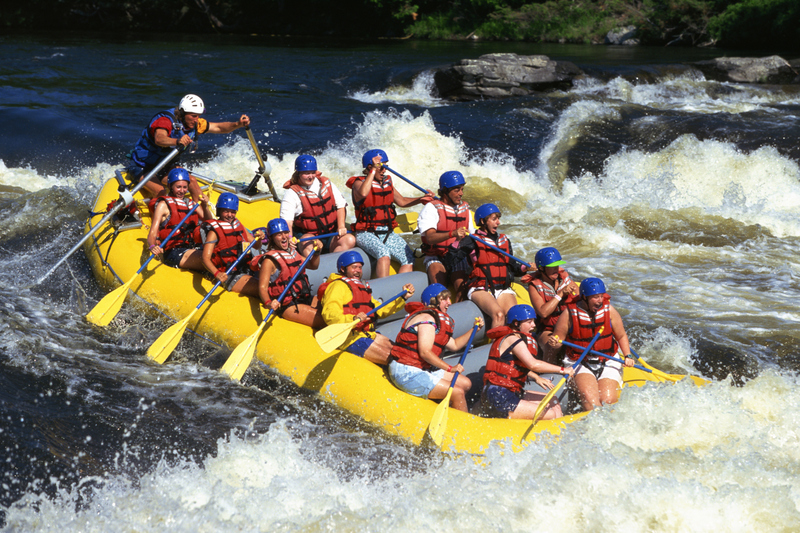 Did you know that the Ottawa Valley is the white water capital of Canada? With over a dozen rivers boasting white water, this region is a mecca for rafters and paddlers alike. Located just over an hour from Ottawa, there are multiple rafting companies along the Ottawa River that can take you out for an amazing day on the river. There are also a number of canoe and kayaking centers that can teach you how to navigate the rapids on your own if you’re up for the challenge. Ottawa was made for biking! I’m always impressed with the extent of bikes paths throughout the city and you should be too, with over 600 km of trails to explore. These paths wind around many of the city’s landmarks so you can not only get a work out, but do some city exploration as well. Bike path through the Experimental Farm. If it’s your first time in Ottawa I suggest taking the bike path that runs along the beautiful, picturesque Rideau Canal. It begins in downtown Ottawa and takes you to Dow’s Lake (part of the Rideau Canal system). From there, you can continue on through the gorgeous arboretum and experimental farm. One of my favorites is along the Sir John A MacDonald Parkway (formerly known as the Ottawa River Parkway) that runs along the Ottawa River from the west end, past downtown behind parliament and then continues along the Rockcliffe Parkway towards the east end. Cover two provinces at once by taking any of the inter provincial bridges over to the Quebec side to ride the paths along the other side of the river and through the grounds of the beautiful Canadian Museum of History. Biking by the Canadian Museum of History with views of the Ottawa River and Canadian Parliament. If you need to rent a bike, try Rent A Bike or Cyco’s, both located downtown. Ottawa has a growing mountain biking scene and there’s no shortage of trails to ride. There’s a wonderful trail system right in the west end of the city called Kanata Lakes (more technical but flat) which is great if you’re short on time or don’t want to venture too far. Mountain biking in Gatineau Park. Mountain biking at Mt St Marie. Outside the city, Gatineau Park has a great trail system but be prepared to work hard as there are lots of big hills! Another option is to head to one of the local ski hills as many of them have mountain biking trails open in the summer. The most popular ones are located at Camp Fortune (which is also in Gatineau Park) and Mont St Marie, about an hour north of Ottawa. Mountain biking at Larose Forest. I should mention Larose Forest as well, located just east of Ottawa. Larose has less technical trails that are more flowy, perfect for beginners and families to ride. The Ottawa Mountain Bike Association is a great resource to look at with a list of trails in the region, including maps. With so many green spaces all over the city and a healthy outdoor living attitude, Ottawa is a wonderful place to spend time outside in the warm summer months. Easy access to so many activities is what has made me fall in love with this urban area. There aren’t many cities that allow you to bike on paths through beautiful parks for 2-3 hrs, or allow you to be hiking in the wilderness within 15 min of leaving a downtown area. Outdoor enthusiasts, Welcome! *If your planning a trip to Ottawa soon and would like more information about outdoor activities, send me a message and I’ll see what I can do for you! Absolutely amazing city I guess worth to visit. Yes Ottawa is a wonderful city! Definitely worth a visit! Thanks for the tips. I will definetely check out Gatineau park on my next trip to Ottawa.